Side Effects of Nicotex-2mg Chewing Gum: Headache, cold and flu-like symptoms; insomnia; nausea; myalgia and dizziness; palpitations; dyspepsia, hiccups; vivid dreams; chest pain; anxiety and irritability; somnolence and impaired concentration; abnormal hunger; dysmenorrhoea; rash. Patches: Skin reactions (discontinue if severe), vasculitis. Spray: Nasal irritation, nose bleeds, watery eyes, ear sensations. Gum, lozenges, SL tab or inhalator: Apthous ulceration, throat irritation. Inhalator: Cough, rhinitis, pharyngitis, stomatitis, sinusitis, dry mouth. Drug Interactions of Nicotex-2mg Chewing Gum: Nicotine increases the haemodynamic and AV blocking effects of adenosine. Monitor for treatment-emergent hypertension in patients treated with combination of nicotine patch and bupropion. Smoking cessation may increase response to various drugs e.g. theophylline, imipramine, oxazepam, pentazocine, some β-blockers; monitor for increased toxicity. 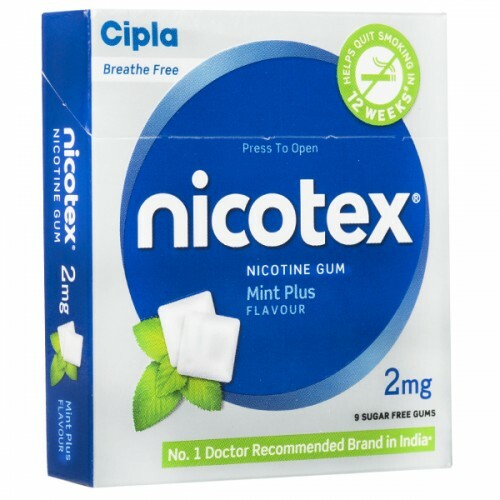 Contraindications of Nicotex-2mg Chewing Gum: Nonsmokers, children and occasional smokers. Recent cerebrovascular accident, acute MI, unstable or worsening angina pectoris, severe cardiac arrhythmias, active temporomandibular joint disease (gum). Mechanism of Action of Nicotex-2mg Chewing Gum: Nicotine is a potent ganglionic and CNS stimulant. It paralyses all autonomic ganglia after stimulation of the respiratory system (a central effect of small doses). Larger doses produce medullary-type convulsions then paralysis. The actions of nicotine are mediated via nicotine-specific receptors. Onset: Formulation specific. Duration: Formulation specific. Distribution: Crosses the placenta and present in breast milk. Metabolism: Metabolised principally in the liver via oxidation. Excretion: Excreted in the urine (10-20% as unchanged drug). Excretion is pH dependant with increased excretion in acidic urine. Special Precautions for Nicotex-2mg Chewing Gum: Use with caution in oropharyngeal inflammation and in patients with cerebrovascular disease, heart failure and renal impairment. History of oesophagitis, peptic ulcer, CV disease, hyperthyroidism, hepatic dysfunction; myasthenia gravis; DM (monitor blood glucose concentrations); pregnancy, lactation; peripheral vascular disease; skin disease (should not be applied on broken skin).